Two hundred women from every section of society gathered at the Dar-ul Aman Mosque in Manchester to celebrate the Ahmadiyya Women’s North West Charity Peace Fair on Sunday 29th January 2017. Women enjoyed marvellous exhibitions from six different charities such as NSPCC, Make a Wish Foundation, Lancashire Hospice, Alder Hey Children’s Charity and Women’s Aid. A total of £1400 was raised. A £2000 cheque was presented to Rebecca Bainton, the regional representative of Macmillan Cancer support. There were a number of Manchester and Trafford Councillors who shared one voice and echoed the communities’ universal motto of Love for All, Hatred for None. The event was closed with a vote of thanks by the President Mrs Samina Irfan and guests were given a tour of Manchester’s most beautiful Mosque. 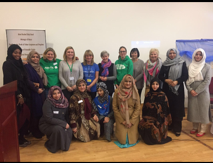 Share the post "Two hundred women gathered to celebrate the Ahmadiyya Women’s North West Charity Peace Fair"